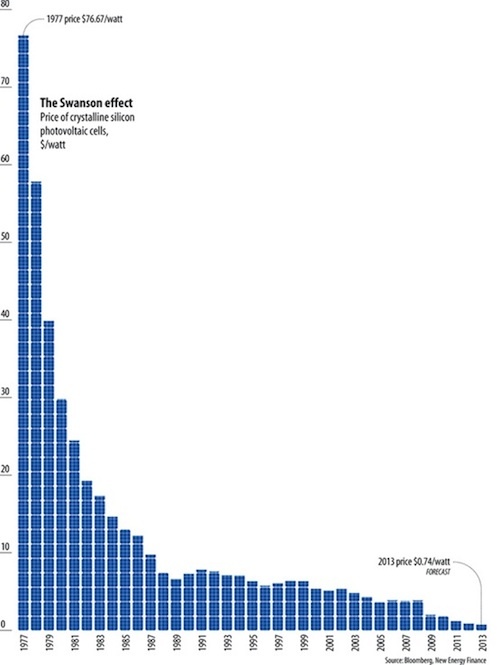 The cost of solar photovoltaic (PV) cells has declined an incredible 99% since 1977. Consequently, a growing number of solar markets are very close to hitting grid parity, Think Progress has reported. One example given of a U.S. market on the verge of grid parity for solar is in Colorado. The Denver Business Journal recently reported on a competitive bidding process involving solar power. It was revealed that on a price basis solar power is now cost-competitive with natural gas-fired power. It’s is the first time this has been experienced in the state, without the need to comply with renewable energy standards, and without even considering carbon costs. In other words, solar power is now becoming cost-competitive on its own terms, without the need for incentives. However, as Think Progress points out, much of the credit for this amazing drop in price does go to state and federal governments worldwide for the support of solar research and development, solar purchasing, subsidies, and the development of renewable energy standards. Those factors continue to be in play in many parts of the world, but it’s clear that subsidies may not be needed over the long term. Additionally, if or rather when governments eventually move to constrain carbon emissions, this should give a further boost to solar power development. Now, the growth of solar power is exponential, and actually has been so for decades, but this steep growth curve has largely slipped under the radar of most people because of the very small market share of overall power (less than 1%). Now solar is getting to the point where the market is big enough and the costs getting low enough for many more people to sit up and take notice of what is happening. If the exponential growth continues, and there’s no reason to think that it won’t, at some point in the not too distant future, solar power will suddenly seem to be everywhere, even though it has been growing exponentially for decades. That assumption doesn’t seem to be supported by the chart which shows prices falling before there were subsidies. I highly doubt government intervention had a long term effect on the prices. Normally government intervention disrupts competitive markets and creates imbalances that are bad for the market. Actually, I agree. As an exponential technology, I think solar has its own momentum aside from govt intervention or support. It can help it or hinder it (and in Spain they’re now actually putting a tax on solar after supporting it for so long! ), but that shouldn’t stop the overall gains that much. I think it’s like many other exponential technologies in that it has been getting more powerful and efficient over time, as well as getting cheaper. That’s why I mentioned that soon enough it well seem to be “everywhere”, just like the internet seemed to be everywhere all of a sudden. Once it grows to be a significant segment of the market, say 10%, it won’t take much to double to 20%, and then double again to 40%. At that point it’s very mainstream.